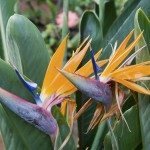 Let’s talk about how to fertilize bird of paradise plants. The good news is that they don’t require anything fancy or exotic. In nature, bird of paradise fertilizer comes from decaying leaves and other decomposing forest litter. Rainwater slowly distributes the nutrients down into the roots. You can provide that natural fertilizer in your garden with a layer of mulch and regular feedings. Any bird of paradise plant, when planted in your garden, will benefit from a 2- to 3-inch deep (5-7 cm.) layer of mulch. Use organic materials such as wood chips, bark, leaves and pine needles. Just make sure to keep a mulch-free zone of around 2-3 inches (5-7 cm.) from your plants. Adding a bit of sand or gravel to the mulch will also help with drainage. Birds of paradise plants tend to be heavy feeders. They prefer a balanced fertilizer that has equal parts nitrogen, phosphorus and potassium (1:1:1). Steer manure offers a natural option that provides this balance and makes a great bird of paradise fertilizer. How and when you fertilize a bird of paradise plant can differ depending on the type you are growing. Below are tips on feeding the three most common bird of paradise varieties. Strelitzia reginae is the plant with the familiar orange and blue flowers. It is the most cold tolerant and resilient. 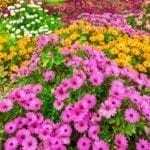 Top dressings of manure or blood meal are always welcomed by these plants. When grown outdoors, this bird of paradise responds well to granular landscape fertilizers. Commercial products such as slow release Osmocote or Nutricote are also good choices. Apply fertilizer every three months during the growing season as directed by the manufacturer. Water plants before and after applying granular fertilizer. Do not leave any fertilizer on the leaves or other parts of the plant. Bird of paradise plants grown indoors need a slightly different feeding schedule. You should be fertilizing bird of paradise plants every two weeks during the growing season and once a month in the winter. Use a water-soluble fertilizer. Mandela’s Gold is a hybrid with yellow flowers. It is more sensitive to cold weather and often grown in pots. You should be feeding bird of paradise plants of this variety every two weeks during the growing season. Top dress Mandela’s Gold plants with a layer of manure or compost. Don’t forget to keep the top dressing 2-3 inches (5-7 cm.) away from the plant stalk. Use watered in fertilizer once a month during the summer months. To encourage flowering, you can switch to a 3:1:5 formulation slow-release fertilizer every other month. Strelitzia Nicolai, the tree-size variety of bird of paradise, will also enjoy a top dressing of manure. These white-flowering “big birds” can grow quickly when fertilized. Feeding young bird of paradise plants of this species should be done once a month during the growing season. However, unless you want a truly giant bird of paradise, fertilizer is not required for mature Strelitzia Nicolai plants.